This article is about the German state. For the town, see Brandenburg an der Havel. For other uses, see Brandenburg (disambiguation). (2017-12-31) "Bevölkerung im Land Brandenburg nach amtsfreien Gemeinden, Ämtern und Gemeinden 31. Dezember 2017 (Fortgeschriebene amtliche Einwohnerzahlen auf Grundlage des Zensus 2011)". Amt für Statistik Berlin-Brandenburg (in German). 2018. Brandenburg (German pronunciation: [ˈbʁandn̩bʊɐ̯k] ( listen); Low German: Brannenborg, Lower Sorbian: Bramborska, Upper Sorbian: Braniborsko) is a state of Germany. Brandenburg is situated in territory known in antiquity as Magna Germania, which reached to the Vistula river. By the 7th century, Slavic peoples are believed to have settled in the Brandenburg area. The Slavs expanded from the east, possibly driven from their homelands in present-day Ukraine and perhaps Belarus by the invasions of the Huns and Avars. They relied heavily on river transport. The two principal Slavic groups in the present-day area of Brandenburg were the Hevelli in the west and the Sprevane in the east. Beginning in the early 10th century, Henry the Fowler and his successors conquered territory up to the Oder River. Slavic settlements such as Brenna (Brandenburg an der Havel), Budusin (Bautzen), and Chośebuz (Cottbus) came under imperial control through the installation of margraves. Their main function was to defend and protect the eastern marches. In 948 Emperor Otto I established margraves to exert imperial control over the pagan Slavs west of the Oder River. Otto founded the Bishoprics of Brandenburg and Havelberg. 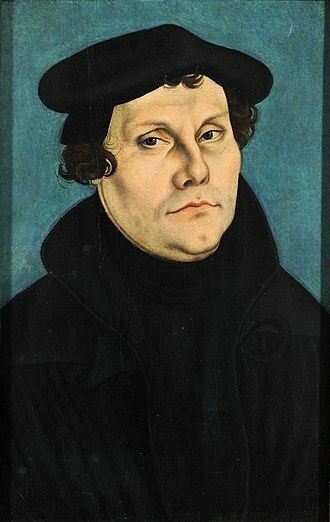 The Northern March was founded as a northeastern border territory of the Holy Roman Empire. However, a great uprising of Wends drove imperial forces from the territory of present-day Brandenburg in 983. The region returned to the control of Slavic leaders. During the 12th century, the German kings and emperors re-established control over the mixed Slav-inhabited lands of present-day Brandenburg, although some Slavs like the Sorbs in Lusatia adapted to Germanization while retaining their distinctiveness. The Roman Catholic Church brought bishoprics which, with their walled towns, afforded protection from attacks for the townspeople. With the monks and bishops, the history of the town of Brandenburg an der Havel, which was the first center of the state of Brandenburg, began. In 1134, in the wake of a German crusade against the Wends, the German magnate, Albert the Bear, was granted the Northern March by the Emperor Lothar III. He formally inherited the town of Brandenburg and the lands of the Hevelli from their last Wendish ruler, Pribislav, in 1150. 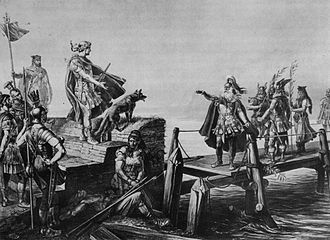 After crushing a force of Sprevane who occupied the town of Brandenburg in the 1150s, Albert proclaimed himself ruler of the new Margraviate of Brandenburg. 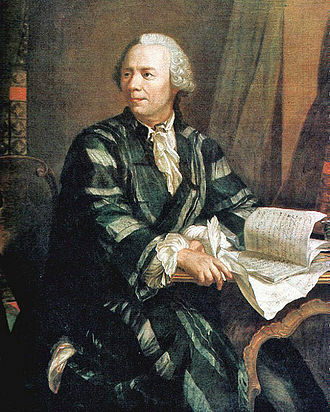 Albert, and his descendants the Ascanians, then made considerable progress in conquering, colonizing, Christianizing, and cultivating lands as far east as the Oder. Within this region, Slavic and German residents intermarried. During the 13th century, the Ascanians began acquiring territory east of the Oder, later known as the Neumark (see also Altmark). In 1320, the Brandenburg Ascanian line came to an end, and from 1323 up until 1415 Brandenburg was under the control of the Wittelsbachs of Bavaria, followed by the Luxembourg Dynasties. 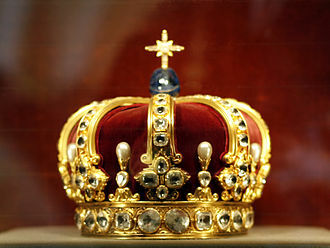 Under the Luxembourgs, the Margrave of Brandenburg gained the status of a prince-elector of the Holy Roman Empire. In the period 1373-1415, Brandenburg was a part of the Lands of the Bohemian Crown. 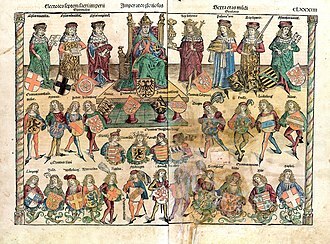 In 1415, the Electorate of Brandenburg was granted by Emperor Sigismund to the House of Hohenzollern, which would rule until the end of World War I. The Hohenzollerns established their capital in Berlin, by then the economic center of Brandenburg. Brandenburg converted to Protestantism in 1539 in the wake of the Protestant Reformation, and generally did quite well in the 16th century, with the expansion of trade along the Elbe, Havel, and Spree Rivers. The Hohenzollerns expanded their territory by co-rulership since 1577 and acquiring the Duchy of Prussia in 1618, the Duchy of Cleves (1614) in the Rhineland, and territories in Westphalia. The result was a sprawling, disconnected country known as Brandenburg-Prussia that was in poor shape to defend itself during the Thirty Years' War. Beginning near the end of that devastating conflict, however, Brandenburg enjoyed a string of talented rulers who expanded their territory and power in Europe. The first of these was Frederick William, the so-called "Great Elector", who worked tirelessly to rebuild and consolidate the nation. He moved the royal residence to Potsdam. At the Treaty of Westphalia, his envoy Joachim Friedrich von Blumenthal negotiated the acquisition of several important territories such as Halberstadt. Under the Treaty of Oliva Christoph Caspar von Blumenthal(son of the above) negotiated the incorporation of the Duchy of Prussia into the Hohenzollern inheritance. Province of Brandenburg superimposed on modern borders. 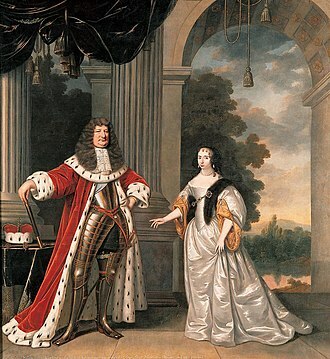 When Frederick William died in 1688, he was followed by his son Frederick, third of that name in Brandenburg. As the lands that had been acquired in Prussia were outside the boundaries of the Holy Roman Empire, Frederick assumed (as Frederick I) the title of "King in Prussia" (1701). Although his self-promotion from margrave to king relied on his title to the Duchy of Prussia, Brandenburg was still the most important portion of the kingdom. However, this combined state is known as the Kingdom of Prussia. Brandenburg remained the core of the Kingdom of Prussia, and it was the site of the kingdom's capitals, Berlin and Potsdam. When Prussia was subdivided into provinces in 1815, the territory of the Margraviate of Brandenburg became the Province of Brandenburg, again subdivided into the government regions of Frankfurt and Potsdam. 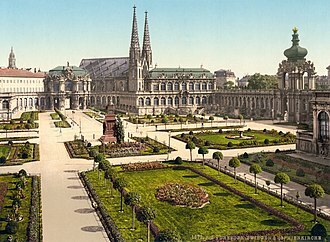 In 1881, the City of Berlin was separated from the Province of Brandenburg. However, industrial towns ringing Berlin lay within Brandenburg, and the growth of the region's industrial economy brought an increase in the population of the province. The Province of Brandenburg had an area of 39,039 km2 (15,073 sq mi) and a population of 2.6 million (1925). After World War II, the Neumark, the part of Brandenburg east of the Oder–Neisse line, was transferred to Poland; and its native German population expelled. The remainder of the province became a state in the Soviet Zone of occupation in Germany when Prussia was dissolved in 1947. Since the foundation of East Germany in 1949 Brandenburg formed one of its component states. The State of Brandenburg was completely dissolved in 1952 by the Socialist government of East Germany, doing away with all component states. The East German government then divided Brandenburg among several Bezirke or districts. (See Administrative division of the German Democratic Republic). Most of Brandenburg lay within the Bezirke of Cottbus, Frankfurt, or Potsdam, but parts of the former province passed to the Schwerin, Neubrandenburg and Magdeburg districts (town Havelberg). East Germany relied heavily on lignite (the lowest grade of coal) as an energy source, and lignite strip mines marred areas of southeastern Brandenburg. The industrial towns surrounding Berlin were important to the East German economy, while rural Brandenburg remained mainly agricultural. The present State of Brandenburg was re-established on 3 October 1990 upon German reunification. The newly elected Landtag of Brandenburg first met on 26 October 1990. As in other former parts of East Germany, the lack of modern infrastructure and exposure to West Germany's competitive market economy brought widespread unemployment and economic difficulty. In the recent years, however, Brandenburg's infrastructure has been modernized and unemployment has slowly declined. In 1995, the governments of Berlin and Brandenburg proposed to merge the states in order to form a new state with the name of "Berlin-Brandenburg", though some suggested calling the proposed new state "Prussia". The merger was rejected in a plebiscite in 1996 – while West Berliners voted for a merger, East Berliners and Brandenburgers voted against it. Brandenburg is bordered by Mecklenburg-Vorpommern in the north, Poland in the east, the Freistaat Sachsen in the south, Saxony-Anhalt in the west, and Lower Saxony in the northwest. The Oder River forms a part of the eastern border, the Elbe River a portion of the western border. The main rivers in the state itself are the Spree and the Havel. In the southeast, there is a wetlands region called the Spreewald; it is the northernmost part of Lusatia, where the Sorbs, a Slavic people, still live. These areas are bilingual, i.e., German and Sorbian are both used. Brandenburg is known for its well-preserved natural environment and its ambitious natural protection policies which began in the 1990s. 15 large protected areas were designated following Germany's reunification. Each of them is provided with state-financed administration and a park ranger staff, who guide visitors and work to ensure nature conservation. Most protected areas have visitor centers. 17.1% of the Brandenburgers are registered members of the local Evangelical Church in Germany (mostly the Evangelical Church in Berlin, Brandenburg and Silesian Upper Lusatia), while 3.1% are registered with the Roman Catholic Church (mostly the Archdiocese of Berlin, and a minority in the Diocese of Görlitz). The majority (79.8%) of Brandenburgers, whether of Christian or other beliefs, choose not to register with the government as members of these churches, and therefore do not pay the church tax. The most recent election took place on 14 September 2014. The coalition government formed by the Social Democrats and the Left Party led by Dietmar Woidke (SPD) was re-elected. The next ordinary state election is scheduled for 2019. The unemployment rate stood at 5.8% in October 2018 and was higher than the German average but lower than the average of Eastern Germany. Berlin Schönefeld Airport (IATA code: SXF) is the largest airport in Brandenburg. It is the second largest international airport of the Berlin-Brandenburg metropolitan region and is located 18 km (11 mi) southeast of central Berlin in Schönefeld. The airport is a base for Condor, easyJet and Ryanair. In 2016, Schönefeld handled 11,652,922 passengers (an increase of 36.7%). It is planned to incorporate Schönefeld's existing infrastructure and terminals into the new Berlin Brandenburg Airport (BER), which is not scheduled to open before the end of 2020. The new BER will have an initial capacity of 35-40 million passengers a year. Due to increasing air traffic in Berlin and Brandenburg, plans for airport expansions are in the making (as of 2017). In 2016, around 49,000 students were enrolled in Brandenburg universities and higher education facilities. The largest institution is the University of Potsdam, located southwest of Berlin. The Brandenburg concerti by Johann Sebastian Bach (original title: Six Concerts à plusieurs instruments) are a collection of six instrumental works presented by Bach to Christian Ludwig, Margrave of Brandenburg-Schwedt, in 1721 (though probably composed earlier). They are widely regarded as among the finest musical compositions of the Baroque era and are among the composer's best known works. ^ BP = Brandenburg Province, SB = Soviet Zone, Brandenburg. With the abolition of states in East Germany in 1952 vehicle registration followed the new Bezirk subdivisions. Since 1991 distinct prefixes are specified for each district. ^ Statistisches Landesamt Baden-Württemberg. "Bruttoinlandsprodukt – in jeweiligen Preisen – in Deutschland 1991 bis 2014 nach Bundesländern (WZ 2008) – Volkswirtschaftliche Gesamtrechnungen der Länder VGR dL". Archived from the original on 17 December 2015. ^ Barford, Paul M. (2001). The Early Slavs: Culture and Society in Early Medieval Eastern Europe. Ithaca: Cornell University Press. p. 421. ISBN 0-8014-3977-9. ^ Institut für Sorbische Volksforschung in Bautzen (1962). Lětopis Instituta za serbski ludospyt. Bautzen: Domowina. ^ Room, Adrian (2006). Placenames of the World. Jefferson: McFarland & Company. p. 433. ISBN 0-7864-2248-3. ^ "Amt für Statistik Berlin Brandenburg - Statistiken". www.statistik-berlin-brandenburg.de. Retrieved 2015-04-24. ^ "Ergebnistabelle Land". Der Landeswahlleiter für Brandenburg. Retrieved 24 April 2015. ^ "The future lies in Schoenefeld". Berlin-airport.de. Archived from the original on 2 May 2011. Wikimedia Commons has media related to Brandenburg. Wikivoyage has a travel guide for Brandenburg. Wikisource has the text of the 1921 Collier's Encyclopedia article Brandenburg. Cottbus is a university city and the second-largest city in Brandenburg, Germany. Situated around 125 km southeast of Berlin, on the River Spree, until the beginning of the twentieth century the spelling of the citys name was contentious. In this context it is to be noted that to identify a citizen of the city either Cottbuser or Cottbusser may be used, the first recorded mention of the towns name was in 1156. In the 13th century German settlers came to the town and thereafter lived side-by-side with the Sorbs, in medieval times Cottbus was known for wool, and the towns drapery was exported throughout Brandenburg and Saxony. In 1445 Cottbus was acquired by the Margraviate of Brandenburg from Bohemia, in 1514 Jan Rak founded the Universitas Serborum, a Sorbian gymnasium, in the city. In 1701 the city part of the Kingdom of Prussia. It was ruled by Saxony between 1807 and 1813, in 1815 the surrounding districts of Upper and Lower Lusatia were ceded by the Kingdom of Saxony to Prussia. 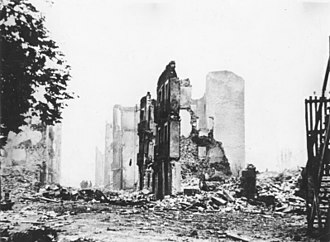 During World War II, Cottbus was taken by the Red Army on 22 April 1945, from 1949 until German reunification in 1990, Cottbus was part of the German Democratic Republic. The Social Democratic Party of Germany is a social-democratic political party in Germany. The party, led by Chairman Martin Schulz since 2017, has one of the two major contemporary political parties in Germany, along with the Christian Democratic Union. The SPD has governed at the level in Germany as part of a grand coalition with the CDU. The SPD participates in 14 state governments, nine of them governed by SPD Minister-Presidents, the SPD is a member of the Party of European Socialists and of the Socialist International, and became a founding member of the Progressive Alliance on 22 May 2013. Established in 1863, the SPD is the oldest extant political party represented in the German Parliament and was one of the first Marxist-influenced parties in the world. The General German Workers Association, founded in 1863, and the Social Democratic Workers Party, founded in 1869, merged in 1875, under the name Socialist Workers Party of Germany. From 1878 to 1890, any grouping or meeting that aimed at spreading socialist principles was banned under the Anti-Socialist Laws, in 1890, when the ban was lifted and it could again present electoral lists, the party adopted its current name. In the years leading up to World War I, the party remained ideologically radical in official principle, by 1912, the party claimed the most votes of any German party. 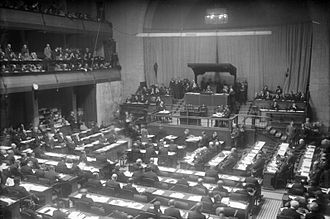 Despite the agreement of the Second International to oppose the First World War, after 1918 the SPD played an important role in the political system of the Weimar Republic, although it took part in coalition governments only in few years. 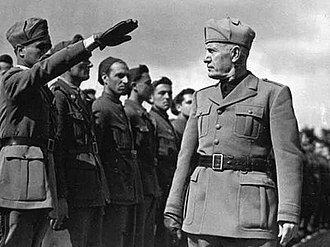 Adolf Hitler prohibited the party in 1933 under the Enabling Act – party officials were imprisoned, killed or went into exile, in exile, the party used the name Sopade. In the Soviet Zone of Occupation, the Soviets forced the Social Democrats to form a party with the Communists. In the Western zones, the Communist Party was banned by West Germanys Federal Constitutional Court, since 1949, in the Federal Republic of Germany, the SPD has been one of the two major parties, with the other being the Christian Democratic Union. From 1969 to 1982 and 1998 to 2005 the Chancellors of Germany were Social Democrats whereas the other years the Chancellors were Christian Democrats, the SPD was established as a Marxist party in 1875. The administrative divisions of the German Democratic Republic were constituted in two different forms during the countrys 41-year-long history. The GDR first retained the traditional German division into federated states called Länder, immediately before German reunification in 1990, the old Länder were restored, but they were not effectively reconstituted until after the GDR had ceased to exist as a separate state. In May 1945, following its defeat in World War II, Germany was occupied by the United States, France, the state of Prussia, whose provinces extended to all four zones and covered two thirds of Germany, was dissolved in 1947. 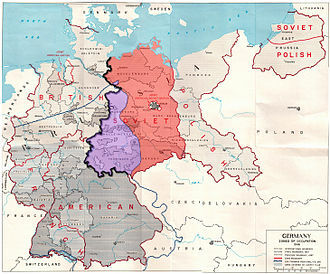 Special conditions were assigned to Berlin, which the four powers divided into four sectors, a united German state government existed in the city until it broke apart in 1948. In the Soviet occupation zone, five Länder were established which roughly corresponded to the states and provinces. Also, the town of Reichenau was ceded to Poland, in 1949, the Soviet occupation zone was transformed into the German Democratic Republic. The five Länder participated in the branch through the Länderkammer. However, the Länder were not constituting entities forming a federal state, as a nod to the legal fiction that East Berlin was still occupied territory, it was neither counted as part of Brandenburg, nor as a state in its own right. East Germany claimed East Berlin as its capital, a recognised by virtually all Communist/Eastern Bloc countries. However, most Western and non-aligned countries did not recognise this, the GDR quickly became a highly centralised state. In 1952, the ruling Socialist Unity Party announced to establish socialism in a planned manner, the Länder were no longer deemed to correspond to the requirements of the new tasks of the state. 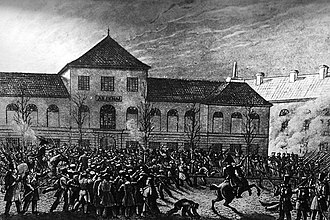 With this law, the Länder were in effect dissolved, while they formally remained in existence, they no longer had any political or administrative function. The Länderkammer remained in existence and its members were elected in 1954 by combined sessions of the Bezirkstage in each Land, however, on 8 December 1958, the Länderkammer was formally dissolved and the states abolished with no objections being raised. Wends is a historical name for the West Slavs living near Germanic settlement areas. It does not refer to a people, but to various peoples, tribes or groups depending on where. In the Middle Ages the term Wends often referred to Western Slavs living within the Holy Roman Empire, mieszko I, the first historical ruler of Poland, appeared as Dagome, King of the Wends. The name has survived in Finnic languages denoting Russia. According to one theory, Germanic peoples first applied this name to the ancient Veneti, and after the period they transferred it to their new neighbours. The Germans in the south used the term Winde instead of Wende and applied it, just as the Germans in the north, to Slavs they had contact with, following the 8th century, the Frankish kings and their successors organised nearly all Wendish land into marches. This process turned into the series of crusades, by the 12th century, all Wendish lands had become part of the Holy Roman Empire. In the course of the Ostsiedlung, which reached its peak in the 12th to 14th centuries, due to the process of assimilation following German settlement, many Slavs west of the Oder adopted the German culture and language. Only some rural communities which did not have an admixture with Germans. With the gradual decline of the use of these local Slavic tongues, some sources claim that in the 13th century there were actual historic people called Wends or Vends living as far as northern Latvia around the city of Wenden. 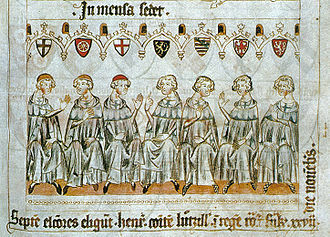 Henry of Livonia in his 13th-century Latin chronicle described a tribe called the Vindi, only one group of Wends still exists, the Lusatian Sorbs in present-day eastern Germany. The term Wends derived from the Roman-era people called in Latin Veneti, Venedi or Venethi and this people was mentioned by Pliny the Elder and Ptolemy as inhabiting the Baltic coast. There they assimilated the remaining Germanic population that had not left the area in the Migration period. Their German neighbours adapted the term they had been using for peoples east of the River Elbe before to the Slavs, calling them Wends as they called the Venedi before and probably the Vandals also. In his late sixth century work History of Armenia, Movses Khorenatsi mentions their raids into the lands named Vanand after them and their tribal names were derived from local place names, sometimes adopting the Germanic tradition. Albert the Bear was the first Margrave of Brandenburg from 1157 to his death and was briefly Duke of Saxony between 1138 and 1142. Albert was the son of Otto, Count of Ballenstedt. He inherited the estates in northern Saxony of his father in 1123. Alberts entanglements in Saxony stemmed from his desire to expand his estates there. In spite of this, he went to Italy in 1132 in the train of the king, and his services there were rewarded in 1134 by the investiture of the Northern March, which was again without a ruler. Once he was established in the Northern March, Alberts covetous eye lay on the thinly populated lands to the north. 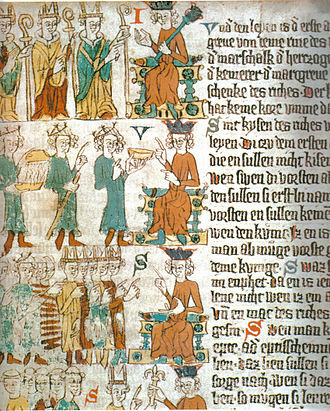 In 1137 Conrad III, the Hohenstaufen King of the Germans, deprived Alberts cousin and nemesis, Henry the Proud of his Saxon duchy, which was awarded to Albert if he could take it. 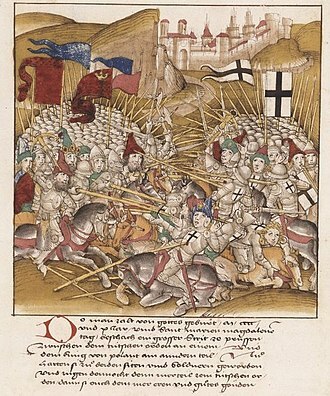 After some initial success in his efforts to take possession, Albert was driven from Saxony, and from his Northern march by Henry, when peace was made with Henry in 1142, Albert renounced the Saxon duchy and received the counties of Weimar and Orlamünde. Brandenburg an der Havel old town in 2015. 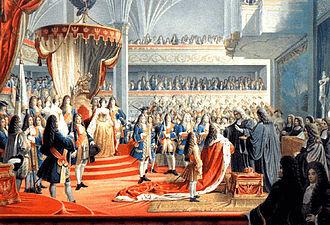 Anointment of Frederick III (I) after his coronation as King in Prussia in Königsberg, 1701. The seal of Albert the Bear. Foundation of the memorial to Albert at Spandau Citadel. Arms of Brandenburg-Prussia in 1686. The GDR (in red) with its original Länder.